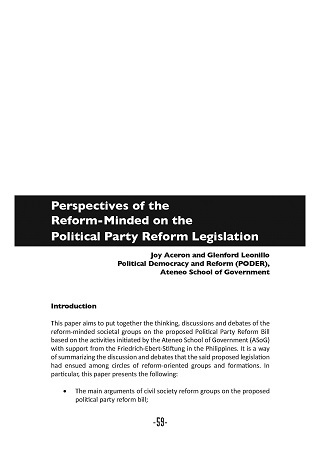 This paper aims to put together the thinking, discussions and debates of the reform-minded societal groups on the proposed Political Party Reform Bill based on the activities initiated by the Ateneo School of Government (ASoG) with support from the Friedrich-Ebert-Stiftung in the Philippines. 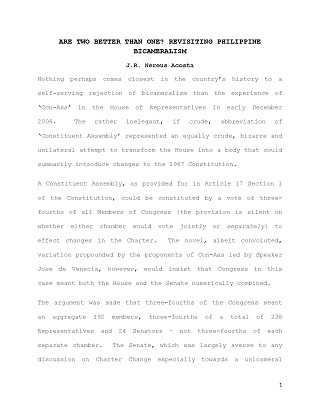 This paper offers more assurance of legislative oversight in a soft state with a tendency towards heavy-handed presidency. 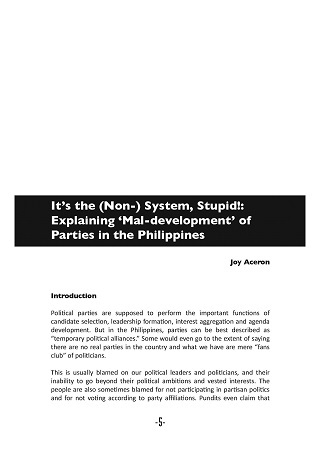 This chapter will search for an aspect of political parties that can explain the mal-development of party politics in the country, and can provide a feasible point of reference for party reform measures. 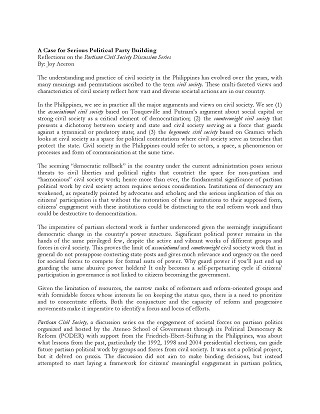 This provides reflection paper on the Partisan Civil Society discussion series, arguing the case for political party building in the Philippines. 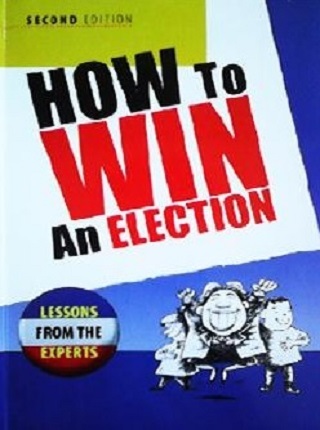 This latest edition presents updated stories of former Governor Josie dela Cruz of Bulacan, Mayor Jesse Robredo of Naga City and Governor Grace Padaca of Isabela, all of whom have lead successful campaigns in the 2007 elections. 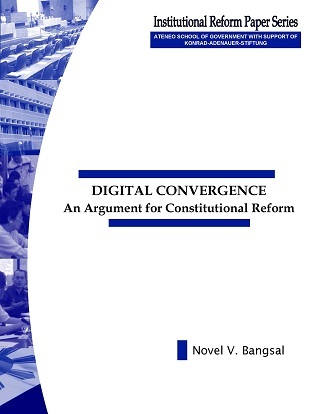 This paper explains the significance of digital convergence to poor countries. 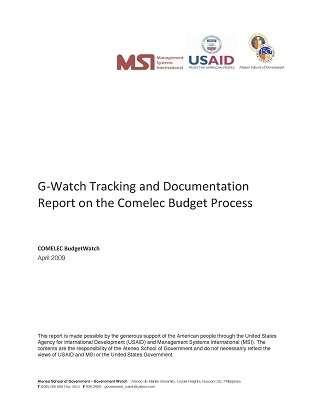 It offers a measure to address the insufficiency of the institutional environment to keep up with the convergence process, to clarify policy ambiguities pertaining to the rules of competition and interconnection. 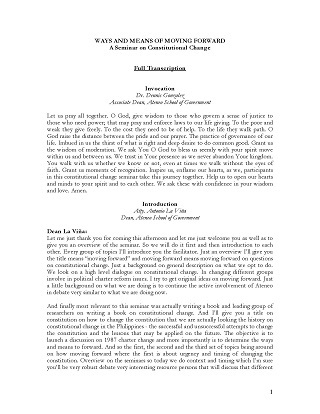 This provides full transcription of the high-profile seminar on charter change in 2008. 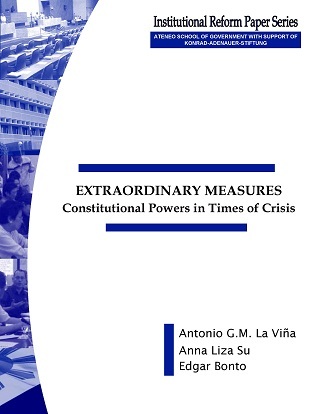 This paper reviews the recourse to emergency powers by four presidencies and examining the intended and unintended consequences. This paper prescribes more practicable ways to avoid difficulties in the operation of public utilities, brought about by constitutional limitations.